Then we were asked to make a titanium ring using Maxwell’s formula. The inscription inside the ring included a tiny, silver hammer—get it? Maxwell’s silver hammer, from the Beatles’ song. At art shows we’ve done in areas close to universities or research parks, it may not be that surprising to find interest in this sort of titanium ring but in other places we are sometimes startled to find a similar interest—you people are everywhere! What is YOUR favorite equation? Or, the one you don’t want to forget? Some of you can’t leave your work behind and want that little reminder on your titanium ring. 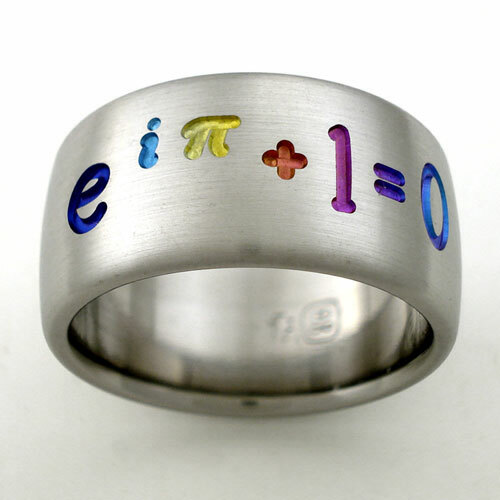 Or, maybe you found that a particular scientific formula is so significant in your life that you want to commemorate it by having it on your titanium wedding ring. Your wish is our command! So what about other favorite equations? Anyone for the Pythogrean Theorum? How about Fourier Transformation or Einstein’s field equations for General Relativity? Newton’s Second Law? Contact us to make your favorite equation or formula a permanent and visible part of your life—geeks unite!